The Kappa Chapter of Delta Kappa Epsilon at Miami University was established in 1852, after a dispute with the local Phi Delta Theta Chapter and the president of that fraternity at the time, future president Benjamin Harrison, lead to the expulsion of a few members and the resignation of a few others. The chapter has enjoyed a long and colorful history since its initial founding at Miami University, and even a book has been written about the Dekes at Miami, so it is safe to say that this about section can only provide a cursory overview of what is a very robust chapter, full of different personalities and attitudes. We have a house, at 325 E Sycamore Street, that was built in 1989 and is able to house 51 total Dekes. It is a centrally located, modern facility that is constantly being updated to offer newer and greater amenities to our members during their stay with us. One somewhat unique feature of the house is a large, off campus parking lot that in most years can fit all of our member’s cars. We also have a very strong connection to Miami University, with a current board of trustees member for Miami University being Kappa Chapter alumnus, and nearly ten buildings, parks, and stadiums on campus have been named for Dekes, including the football team’s Yager Stadium. 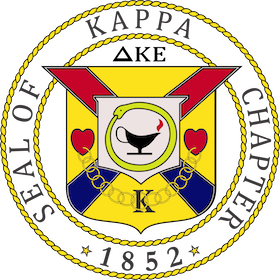 At various times, the Kappa Chapter has volunteered its former homes for use by the university, including to house President Benton’s family, when no suitable home could be found. We’re also very proud of our alumni base, which is active in our house and with our members. With over 500 alumni members, Kappa Dekes have gone on to be CEOs, entrepreneurs, scientists, and very accomplished and valued members of their communities, which we hope is due in no small measure to their experiences at Kappa.